I bought a pink dress to wear on my daughter's moving up ceremony tomorrow. For a while, I thought of wearing just plain pink nails to match, but I changed my mind when I saw a leopard printed item in my closet. 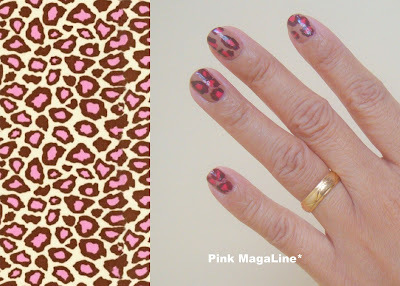 Pink leopard nails? Sounds fabulous huh! This is my first time to do leopard-printed nails. I used tan as a base then hot pink and black for the print. The hot pink is the same Sally Hansen polish I used for Hello Kitty nails. The products I used from left to right: Sassy Black Magic, Sally Hansen Frutti Petutie, Caronia Colorless, and Caronia Touch of Tan. Just like my Hello Kitty nails, I know my first try of leopard nails is not perfect. I will surely do it again using different colors next time. I am thinking of yellow or maybe purple. We will see. Do you experiment in painting your nails? What design would you like to try? Any nail art product to recommend? Nice painted nails sis. For my nails, I leave it to the salon for design and color. I can't reach anymore my toenails and I have a hard time cleaning my finger nails by myself. I want to try Sassy Black Magic! Caronia touch of tan is a classic, adding the pink leopard print made it funky! Great idea. So cute! Love the hot pink nail polish, too! Really pretty! I don't know how to polish my nails myself so I admire those people who can do it themselves. Even more to someone who can do nail art. Kudos sis! Reminds me to have a mani/ped soon!